You are here:Home Hints and Tips How much vocal science do I need to know as a voice teacher? 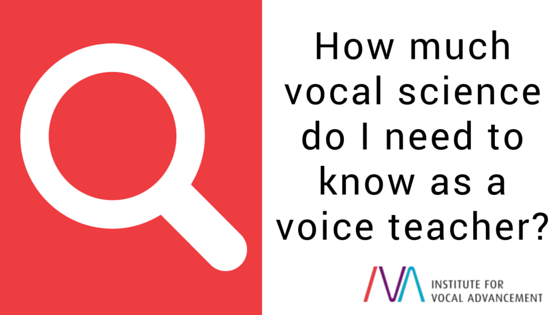 This question piqued my interest, because I’m a successful private voice teacher and have been for over 20 years; however, my knowledge of vocal science is limited. Based on my experience, vocal science can be useful and enlightening, but it is not first on my list to becoming a great voice teacher. A vocal science teacher can lecture his class all day about how vocal cords work with the larynx, explaining in great detail how, for example, you can control the pitch of your voice by using muscles in the larynx to change the tension and elasticity of the vocal folds. Learning about the science and physiology behind singing is interesting, but at the end of the day, none of the students in that class are better singers having learned about it. I have long been taught that “the learning comes from the doing.” This is why the IVA method is so effective. Our cause-and-effect approach to learning is what makes us such successful teachers. We can have people doing it—experiencing the sensations they need to learn—well before they understand what muscles are involved in the process. It’s the how that is of primary concern; the why isn’t essential in teaching good, healthy singing. Therefore, it is imperative that teachers train and do their own work. Having a basic understanding of vocal science—knowing why something works or doesn’t work—is useful and can help us as teachers choose better exercises faster for our students. However, I still believe that the cause-and-effect approach is primary. Students (and teachers!) must do and feel and experience for themselves how to develop and improve and, eventually, master the art of singing—learning the science is secondary. It is great to belong to a method that offers the learning of both, and we can tailor our teaching to the needs of our students and teachers.